The following is a resource by Pastor Joshua Scheer published by Steadfast in the Parish, originally published here. A free downloadable and printable PDF of the article is here. We have a problem in the Church. Our children are not learning the Faith or how that finds expression in our daily lives. Too often, the false gospels of the world have been inching their way into our children’s souls so that by the time they are adults, the faith given to them in Baptism has been shipwrecked through our own negligence. The times only are getting worse, and the world is becoming much more public in its hatred of the Gospel of Christ Jesus and those who follow Him. So what can we do? 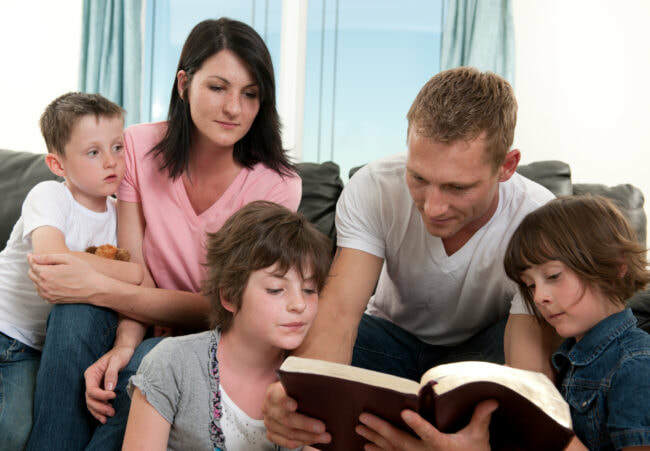 The Church has tried a number of things (Sunday School, longer Confirmation, more classes offered), but all of them have not fixed the situation because they failed to acknowledge first and foremost who has been given the authority and responsibility to God for the religious instruction of children. God has primarily given that task to the parents. The Christian Faith is meant to be a life-filling one. This means that from rising to going to bed our lives are to be reflective of the Gospel of Christ Jesus. This means a life filled with repentance and faith in Him. It means that the way that husband and wife interact has changed. It means that there is a great earnestness to pass on the Faith to children that cannot be found elsewhere. It means that the way the world does things is not going to be the way that Christians do. The key to raising our children in the Faith is the household. For too long, parents have delegated both the time and task of religious practice to the Church. For too long, Sunday mornings have been viewed as time for Jesus while the rest of the week has scarcely been sanctified by God’s Word and prayer. The key is the home. It is in the home that God places us for the most time. It is in the home that our struggle between sinner and saint takes up most of our lives. It is there that we need His Word most. This is not an either/or, as Church is essential to the Christian home and in no way should the home become a substituted for regular attendance of Divine Service. So as a solution, I am suggesting and challenging you to establish a Family Altar in your home. This is not a place in your house (though it could be) but a specific time for your household to gather around God’s Word and prayer. God has so ordered our lives that there are some great times of the day that could work to establish a Family Altar, when we awake, when we go to bed, or when we sit down to eat. These times offer us ample time to calm down from the hectic pace of life to hear and pray. These things happen each day and already have habits associated with them, so adding prayer to these times should hopefully be easier. The father should lead the time of devotions (he is the God-appointed head of the household). If dad is typically not the spiritual one, he should be, and this is a good way to re-assert his God-given authority in the household. A father who gives up his authority is still responsible for everything that goes on in the household in God’s eyes (you can’t shuck the responsibility before God, even though you may be able to pawn it off on your wife). A father’s chief duty is to teach their children the Faith. Establish a time and stick to it (make it a habit). It may be helpful to establish a certain place as well. A good goal would be to have a time in the morning and in the evening to pray, reflecting that our whole day is God’s. Use something that is practical, short, profound and yet simple, relevant, and flexible. I would suggest the short prayer orders of the Small Catechism for your household. Is it really necessary for the father to lead? Yes it is. God looks to him as the head of the household, made so by God’s ordering. In leading this may mean that he may have to delegate tasks to others, but this should never mean that the father is uninvolved or absent. Certainly there may be times when one family member may not be able to be there, but the father should always try to be there. What about those days when it just doesn’t happen? Let those days be few and the exception. Do not let the world have your family or your kids! Take them back to you as they are God’s gifts to your marriage, to your household. What if some of the family can’t make it? The Family Altar should be maintained even if some cannot attend. If one member of the family regularly is missing, then that matter should be resolved. If you have younger children it may be hard to keep them involved. You may be surprised though at how young children will gladly join into a daily routine of a Family Altar. Certainly they can be encouraged to sit quietly. Another option is to give them a quiet task while they sit with the family. You can either change bedtimes or Family Altar times to alleviate this problem. How do we keep our routine going on trips or special times in life? The same way that you keep your other routines going (eating, sleeping, etc.). You do them because this is who you are. Having a daily Family Altar is a part of the day, no matter what is going on that day. If you have guests, invite them to be a part of your Family Altar time. If guests do not want to be a part, give them some other things to do while your family has its time. What if my wife or family is unhappy or bored with what I am doing? You can be sensitive to your family members and even change some things, but the change should never be in favor of having no Family Altar time or one which does not reflect our beliefs as Lutherans. What about single moms or households where the father is negligent of the Spiritual lives of the family? Single moms are the heads of their households because there is no father there. In many cases it may be because of the father’s sin. Sometimes they sadly find themselves as widows with the extra responsibility. In any case they have the responsibility to establish a Family Altar time. Special note should be made to raise sons to take over the Family Altar time as they will need to do so when they have families. In the case of a negligent father, the mother must make do with what she can, trying to encourage her husband (without nagging) to take up his God-given role and yet also encouraging the faithful life of her children. Your pastor is available to visit and meet anytime to help you in any way. We haven’t done the Family Altar for over two weeks after a good start, what do we do? There is only one thing to do, repent and restart. Our Lord offers forgiveness to us when we fail (sin). In that forgiveness is the power to start over, to begin anew. There are more “family devotion” books than can be listed. I would suggest a simpler routine at first and then adding to it as the Family Altar becomes routine. Your pastor is probably one of the best resources for this task. Also other fathers in the congregation may be good resources. Family Altar time can include more than just what I have suggested from the Small Catechism. You could read Bible Stories for children to learn, or you could use the time for memory work with Sunday School or Confirmation Class. There is as I said before many devotions which could be used in the time. The sky is the limits when finding “extra” things that you could do with your Family Altar time. The Family Altar is the daily outgrowth of what happens for your good on Sunday morning. From what the Lord gives in Divine Services you are enabled and encouraged to establish and keep a Family Altar going. Regular Church attendance (hearing God’s Word, receiving the Lord’s Supper) is essential to keeping a Family Altar going.